Ephraim Shores Resort & Restaurant offers you the prime location for a summer getaway at a Door County waterfront resort. As we are edging closer to the end of summer, get out to experience the joys and views of historic Ephraim and greater Door County, Wisconsin. Ephraim, Wisconsin has a lavish number of attractions, many of which won’t be around after Labor Day. The summer concert series Evenings in Ephraim comes to a conclusion on Monday, August 31st. Every Monday from 6:00 to 8:00PM at the Harborside Park Gazebo Ephraim celebrates local music. Come out as the sun sets over Eagle Harbor and the humid day turns into a relaxing evening. Highlighting August performances are folk singer Katie Dahl, jazz and pop group the Sam Fazio Trio, Randi Fay & Limited Edition, and Tradecraft. Closing out the series will be the acoustic classic rock and vocal harmonies band, The Sidekicks. The history of the city and surrounding area is a big part of the culture in Ephraim. The city was founded in the mid-nineteenth century by a Movarian religious community from Norway. The church and the cities founder played a big role in making the city what it is. Movarian Reverend Andreas Iverson not only founded the city, but also set the city up as a port for the Anderson brothers, a Norwegian shipping family. Today, the home of Reverend Iverson and the operations buildings of the Andersons are just a few of over 30 buildings preserved by the Ephraim Historical Foundation. The Ephraim Historical Foundation has filled the summer with events and tours at their various museums. Alas, as the summer comes to a close so does the foundation’s daily events. While you still can, check out the foundation’s tram, trolley and walking tours of Ephraim and enjoy the unique sites this city has to offer. After Labor Day the Foundation remains open on weekends through mid-October. Peninsula State Park and Eagle Harbor can occupy a whole weekend. Sand beaches throughout Ephraim give your hot days the relief they want. Kayaking through the harbor is also an option thanks to the Ephraim Kayak Center. Peninsula State Park offers scenery and experience for the ages. Hike the trails of the almost 4,000 acres of park and marvel at the views of the geology. The Park also hosts the Peninsula State Park Golf Course, 18 holes of Door County glory. It does not take long to see why this place attracts almost one-million visitors every year. Ephraim Shores Resort & Restaurant is a hub for your summer excursions. A family-owned establishment since 1969, the resort has an indoor pool and whirlpool, wireless Internet access, an exercise room and a game room as well as the Second Story Restaurant, Ephraim Shores’ own addition to the unique dining options throughout Ephraim. The resort has ten variants of rooms and offers its visitors free bicycle rentals to explore the quaintness of Ephraim, the beachfront of Eagle Harbor and the trails of Peninsula State Park. All of these located just a short distance from Ephraim Shores. 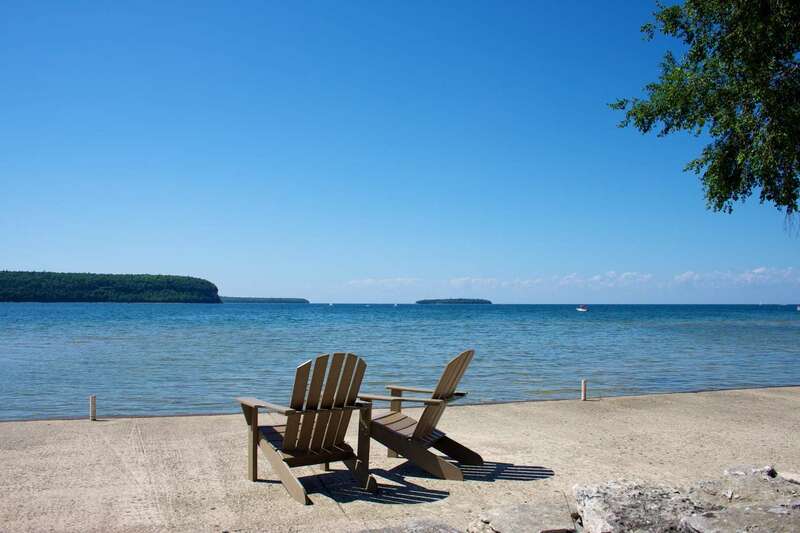 Ephraim Shores is a Door County waterfront resort and a fun family getaway . Rooms fill up fast at this Ephraim hotel so be sure to book in advance. Get in touch with Ephraim Shores, and book a room by calling 920-854-2371, 877-854-2371, or by email at [email protected].